It's not unusual to find a deer fawn or an elk calf in the woods — or even in town — this time of the year. If you find a deer fawn or an elk calf, the best thing to do is keep your distance and leave the animal right where you found it. "We receive calls every year from people who found an 'abandoned' baby bird or mammal and would like us to take care of it," says Ron Stewart, regional conservation outreach manager for the Division of Wildlife Resources. "While we appreciate and share the caller's concern, the best thing to do with a baby deer or elk is to leave it right where you found it." Stewart says deer and elk use several techniques to help their young avoid predators. "Often these strategies make it look like the adults have abandoned their young, when actually they're doing their best to protect their young," Stewart says. "For example, deer fawns learn to walk soon after they're born, but they aren't very coordinated and they aren't strong enough to run away from predators. So, evolution has added a few safety measures. "Most of the animals that prey on fawns have a good sense of smell, but they can see only in black and white," he says. "Deer fawns are born scentless; they don't have an odor, and predators can't smell them. Also, if you looked at a deer fawn in black and white, their creamy brown coats would be the same shade of color as the new grass and leaves. Add a few spots to their coats and they're well camouflaged." Because a fawn doesn't have a scent and it's camouflaged so well, hiding the fawn for its first few weeks of life is the best way to protect it from predators. "The fawn's mother will usually move away from the fawn to feed and rest, but she will still remain reasonably close by," Stewart says. "If she senses danger, such as a human, she will leave the area in hopes of luring the 'predator' away from her fawn." Stewart says people, who can see a full range of color, often see a fawn in its hiding place. "Since the doe has left the area, many people think the fawn has been abandoned, and they pick it up," he says. "That's the worst thing you can do; without knowing it, you've just taken a fawn away from its mother." So what should you do if you see a deer fawn or an elk calf in town or in the woods? "First of all, don't approach it," Stewart says. "Watch it or take a photo of it from a distance, but don't approach it. If you get too close, the scent you leave could draw a predator to the animal. "Numerous studies have also shown that predators will follow human tracks. I've watched coyotes and other predators cross a path that someone just walked and immediately turn and follow their path. I don't know if the predators are curious or if they've learned that humans can lead them to food, but if you've just gotten close to a fawn, you'll lead the predator right to it. 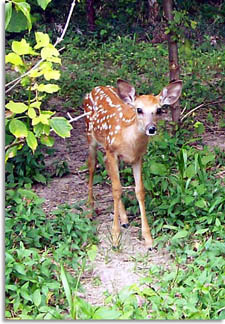 "If you see a fawn or a calf, it's best to stop quite a distance from it. Then continue past the animal in a loop so the predator follows you around and away from the fawn or calf." Finding and petting baby animals is another problem. "The animal's survival depends on it staying scentless," Stewart says. "If you touch the animal, you've placed your scent on it. That will make it easier for a predator to find it."